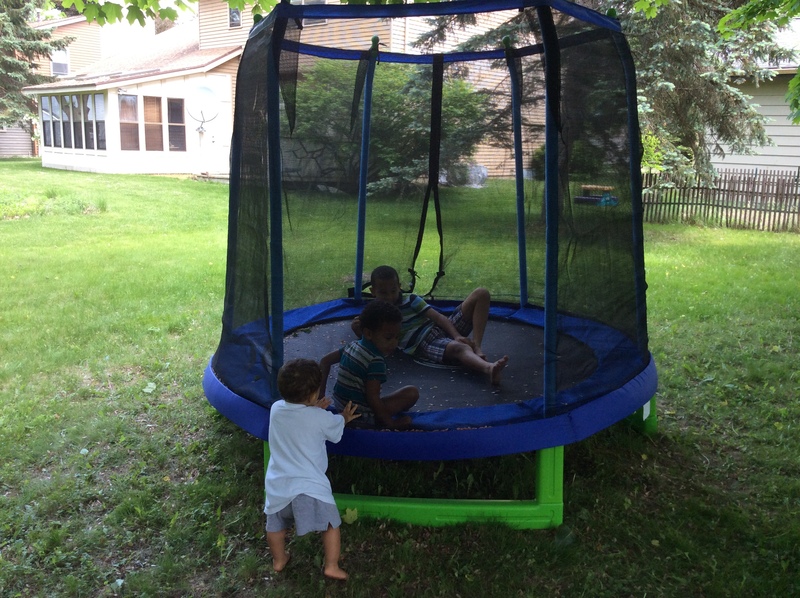 The boys’ uncle sent them a trampoline for Christmas. Memorial Day weekend is the perfect time to build outdoor toys. The weather is finally warm enough to play outside; enough months have passed since Christmas to make it seem like a brand new gift; and parents have an extra day to recover from the trauma of assembly. This trifecta of perfect timing was marred only by my being sick. I had just your garden variety virus, but my throbbing head and weak limbs did not feel like trampoline-building. This did not stop my wife for a moment. If I couldn’t do it, she would. I begged her to hold off, but she was a woman with a plan, and that plan involved happily bouncing children. All I had to do was bring up the box from the basement. Rather than stand in the way of a mother’s goals, I did as asked. Then, I entertained Big Man in the sun room as Mommy and the older boys exited to the back yard. She did a good job building, but a trampoline, with all its required tautness, presents a struggle for any individual builder. By the time two female neighbors had come to check on her, I realized I had to abandon this being sick business. I took Big Man out to help Mommy. With two adults working, we finished the job without much trouble. The worst part was keeping track of the two pages of instructions among the 20 pages of safety guidelines. On the plus side, that was 20 pages of booklet we could ignore. If this picture were in the instruction booklet, it would have a giant, red X over it. I did notice one headline in the safety area. It was accompanied by picture of two stick figures bumping heads, complete with pain lines radiating from the skulls. 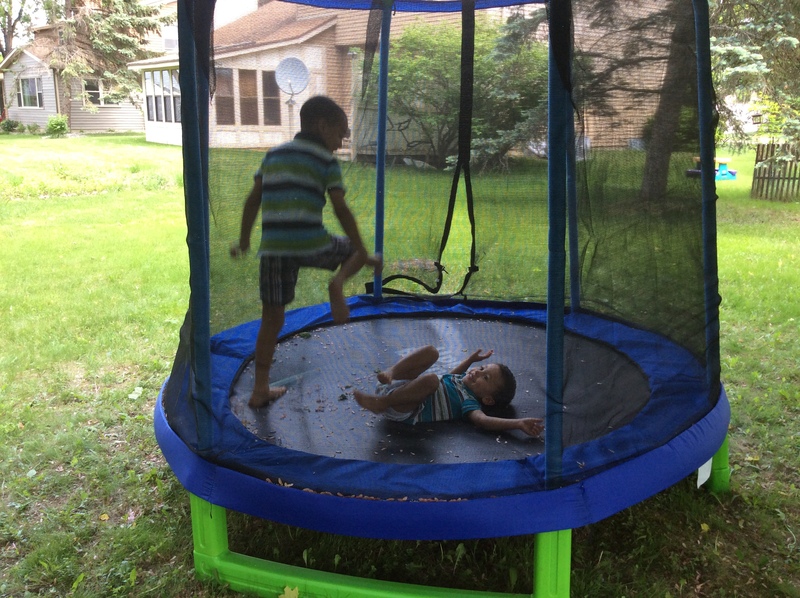 It was a funny picture, accompanied by a ridiculous admonition: “Only one person should be on the trampoline.” The entire family had a good laugh over this one. Why didn’t they just tell us to take it apart and put it back in the basement? One person at a time? How could that be fun? Yes, they were likely to bump heads, and yes, that might hurt for a minute, but hadn’t I just risen from my deathbed to make this fun possible? They went two and three at a time. They crashed into each other in all kinds of hilarious ways, and they all got over it. Because it was fun. Because sometimes fun comes with bumps and bruises. Because we’re not the kind to make trampoline memories; we make Thunderdome memories. The next challenger is ready. Just imagine how awesome it will be once we get the chain saws and pikes hung from the sides. This entry was posted in Random Toy Box and tagged boys, children, Dads, family, fatherhood, humor, Mad Max, outdoor fun, safety, trampolines. Looks like that little one is ready to storm the gates! Watch out big brothers! He’s coming on strong – puts the “growing” in growing boy. What about a bungee cord? Have you recovered from your “man flu?” I mean terrible virus? I’m feeling much better now. Thank you for your mockery. I mean concern. You have a really good woman there. That’s what she tells me. Just. The. Best. Too funny about reading the mommy blogs and figuring out some of the secret code. And your kids a just so cute…so cute! Thanks, Angie. God has certainly blessed us with cuteness. And mommy blogs are the code book for cracking the secret society. Scott, that isn’t big enough for you, or the boys’ uncle. What kind of uncle sends a gift that he can’t play with when he visits? It does look like you can close it up and sit in a lawn chair with a beer watching, so you got that going for you. It seems like they should have a daddy/referee chair built right in, doesn’t it. With cup holder, of course. But I guess there’s no need for a referee since there are no rules in Thunderdome. Two kids enter…one kid leaves. My husband is dealing with a “man cold” right now as well. 🙂 Our trampoline came with the safety warnings sewed onto the outside of the net, which we tore off to save us the guilt of breaking every rule, every time. I’m slowly, painfully learning that fun almost always “comes with bumps and bruises” when you live in a house with all boys! With boys there’s no time for overthinking safety. Just have the Band-Aids ready because fun won’t wait. Fine job, one and all. Please don’t actually START the chainsaws, Scott. Ok. We have the first rule of Thunderdome: everybody has to start his own chainsaw by himself. And only use the 8-pound bowling balls in the juggling routine? They’re tough kids; they can go 10-pound. Love it! I bought a bounce house last summer and it says no more than 3 kids at a time. At Gage’s birthday party let’s just say hitting heads was a common ailment. Bouncing is so much more fun with a friend . . . and a dozen or so random other kids.